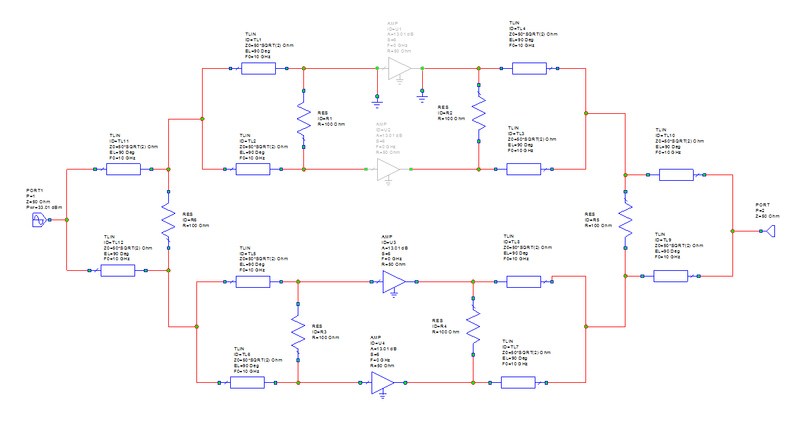 Often when designing power combined amplifiers, not enough thought goes into choosing isolation resistors such that they are sized correctly for graceful degradation. Ordinarily, there is very little dissipation in the isolation resistors, unless you have some serious phase mismatch going on between the MMICs you stuffed in there. 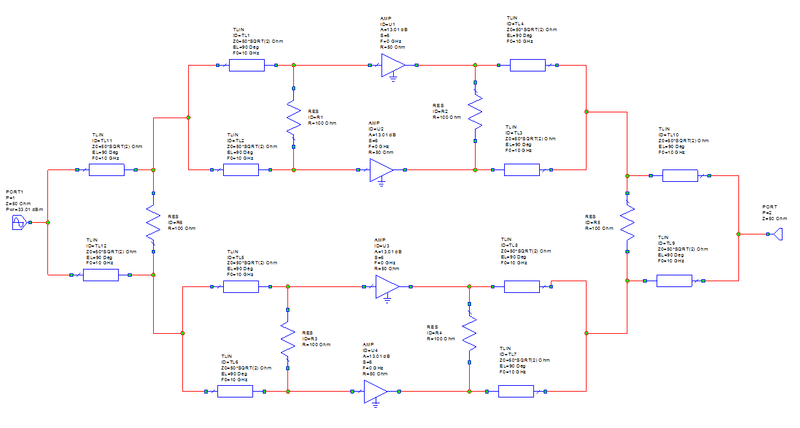 The real problem is ensuring that the amplifier limps along after one MMIC fails; if you don't design the combiner network correctly, one amplifier failure can blow a resistor which could lead to another amplifier failure and so on. On this page we aim to clear up some of the mystery, and show you how to do this yourself using EDA software and harmonic balance. 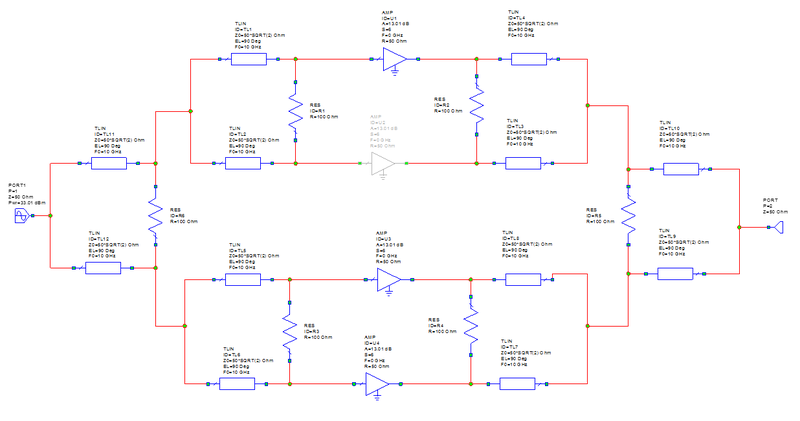 The examples below are not meant to replace hard work of actually analyzing a circuit, indeed, you may get completely different answers if you used coupled line couplers to create a balanced amplifier (Langes), and the interconnect lengths (which are zero below) will have some effects. Also, you might want to consider large signal models, for reasons that will become apparent. Let's start with a simple, two-way power combined amplifier, shown below, using ideal Wilkinson power dividers. It uses linear amplifier elements, but it will suffice for the topic at hand. The amplifiers provide 13.01 dB gain and 10 watts output power, such that a 1 watt (30 dBm) input signal is amplified to a 20 watt output. In order to access harmonic balance stuff, you need to change the input port to a source (right click it in MWO to reveal properties). Below, harmonic balance is used to plot the output power and the dissipated power in the two resistors. The notation "PT" means total power, so it includes non-existent harmonics which is not a problem. The frequency fall off is due to the reflection of power from the Wilkinson on the input, it is only fully impedance matched at 10 GHz. Now, let's see what happens when one of the amplifiers dies. In this case it acts like an open circuit, but we could have just as well shorted it out. In summary, here is the worst-case power dissipation of the resistors. When you are sizing them, be sure to consider if you are designing for a pulsed application (which reduces thermal dissipation) and then you need to derate them per company or customer guidelines (typically 50%). You are not done yet, you need to perform a thermal analysis to see if you are in the safe operating limits; depending on the temperature you might have to derate them even more. Consider the new CVD diamond resistors that are available to get you out of thermal nightmares! It's time for a Microwaves101 Rule of Thumb! 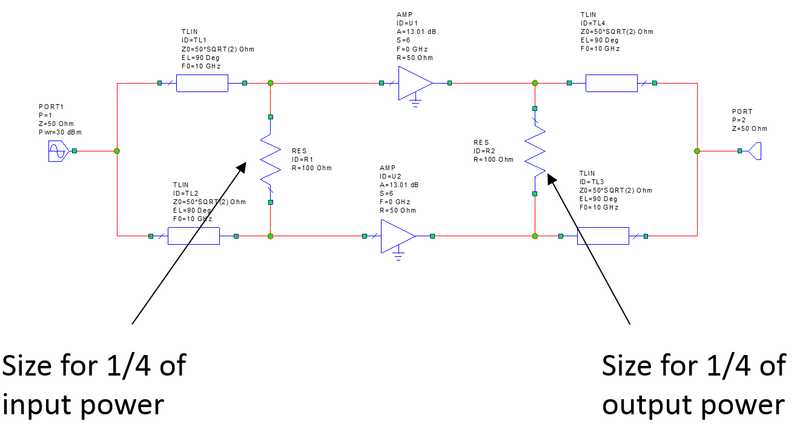 Rule of thumb #127: When power-combining two amplifiers using Wilkinsons in order to ensure graceful degradation, the isolation resistor in the input divider needs to be sized to be able to withstand 1/4 of the average input power. 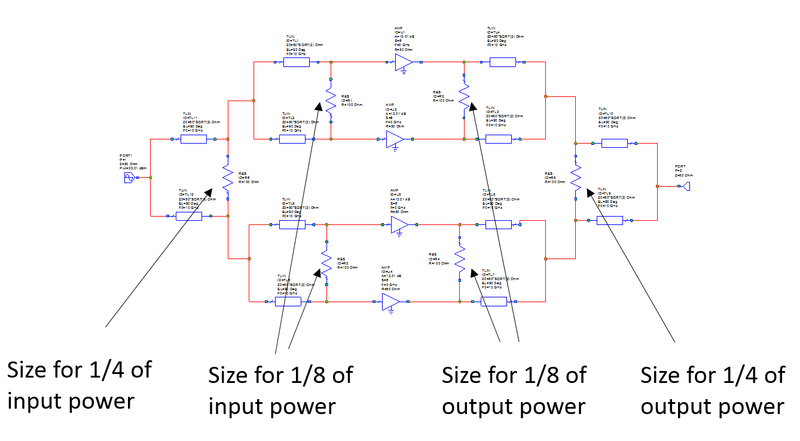 The isolation resistor in the output combiner needs to be sized to withstand 1/4 of the average output power (or one half of the average power of a constituent power amplifier. This rule can be extended to corporate combiners by considering each Wilkinson separately, as we will show below. Below is a four-way amplifier, made by cascading Wilkinsons. We increased the input power to 16 dBm in order to maintain the illusion of combining 10 watt amplifiers to get 40 watts. To analyze the resistors in this amp, we split them onto to plots. Below is the dissipation in the input resistors R6, R1 and R3. 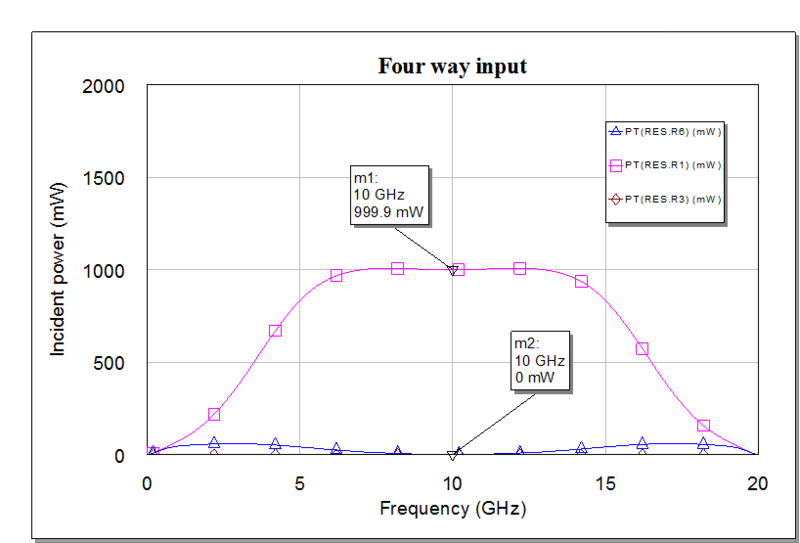 The full scale of the plot is the input power, so you can see that R6 is dissipating 1/16 of that power and R1 is getting hit with 1/8 of the power. Output (five watts), and R5 gets 1/16. Five watts is a serious amount of power for a resistor that needs to act like a lumped element at 10 GHz! Studying the input and output plots you will understand that input resistors can always be smaller than output resistors. Next up, two amplifiers, side-by-side, fail. This has a stressful effect on the first divider/last combiner isolation resistors. On the input, R6 is getting blasted with 1/4 of the input power. No other resistor dissipation occurs. On the output, R5 is taking some real heat and 1/4 of 40 watts, or ten watts. Indeed, that resistor dissipates as much power as the remaining amplifier puts out! Now let's look at non-neighbor failure. This is a much less stressful problem. On the input, R1 and R3 are each hit with 1/8 of the input power (the lines are on top of each other). R6 has zero dissipation. On the output a similar condition exists, R2 and R4 dissipate 1/8 of the original output power. Up until this case, when we disabled an amplifier, we made it into an open circuit. 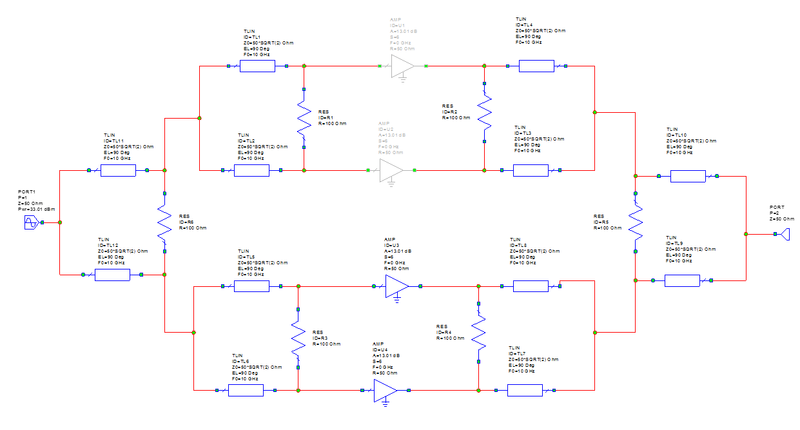 What if an amplifier failed and acted like a short circuit? 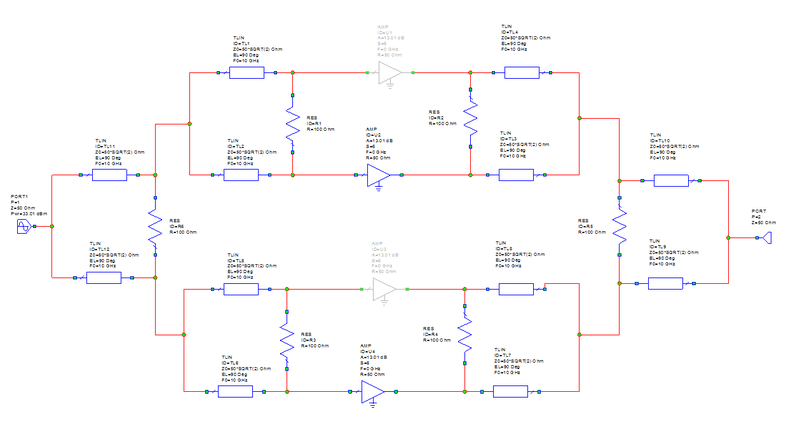 Worse yet, what if its neighbor failed in an open-circuit fashion? This special case creates a big problem for resistor R1. It has accidentally become a matched load, and is eating half of the driver input power. If you don't size it for 1 watt, it may blow up. But what if it did blow up? It would likely not cause any harm to the remaining two MMIC power amps. You can debate this scenario at your next design review, and let us know if you end up sizing the resstors to handle it. On the output, R5 is getting 1/4 of the original output power, or 10 watts. this is no different than the case where two neighbor amplifiers fail in the same manner (both short, or both open). Let us know if you find this page helpful, and send comments if you have any suggestions for improving the content.